NOT JUST MORE OF THE SAME OLD THING! At English Country Gardens we like to offer something different. Be the first on your block to have one of the unusual from English Country Gardens! CLICK ON ANY OF THESE PHOTOS TO VIEW A LARGER VERSION OF THE PHOTO. 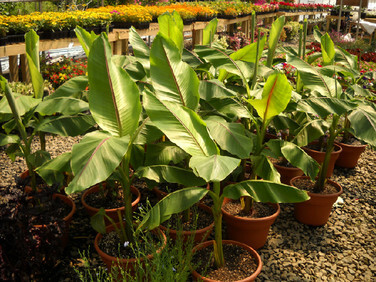 English Country Gardens introduces cold hardy Basjoo Banana Trees. These are hardy to zone 4 and perfect for adding a tropical accent look to your pool, patio, or garden! These Loofah Sponges were grown right here at English Country Gardens. That's right! We use them in our handmade soaps we call Botanical Suds. You'll love them. Ranging in sizes from 8 - 14 inches long and diameter from about 2 inches to about 3 1/2 inches. Which basically means some are short and stout and some are long and thin. 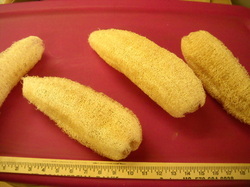 Loofahs are in the cucumber family and grow on vines. Harvesting these sponges at the right time can be a bit tricky but don't you think they turned out pretty? The original pot scrubber, records indicate that the Loofa Sponge was actually used by ancient societies to clean their pots. If find it is a great help in the kitchen. I use it to scrub my pots without having to worry about scratches!